Having arrived in Perquín on Sunday, I had to wait until Tuesday to visit the museum of the Salvadoran revolution, which remained closed every Monday. I trudged 100m up the steep hill, for the second time, to a basic wooden construction that acted as both a gift shop and concession stand. The ubiquitous image of that most iconic of revolutionaries, Ernesto “Che” Guevara, stared back at me from a t-shirt. I paid the $2 admission fee to one of two expressionless teenage girls, who would have endured at least a couple of years of civil war before its official end in 1992. One yelled in the direction behind her toward a humble one-floor building, from which emerged a hobbling Salvadoran man, who looked to be thirty something. He greeted without introduction and led me to the two-room building, where the private tour would begin inside. 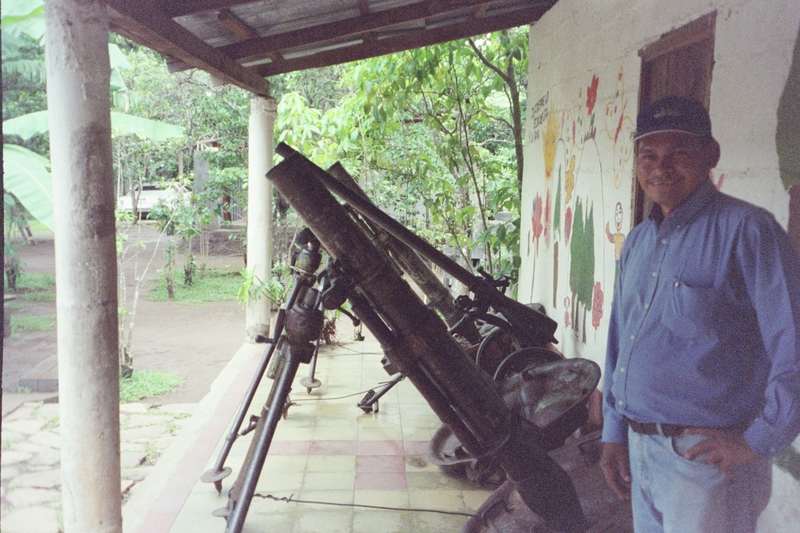 The walls of the first room were covered with battle scene photography, portraits of significant revolutionaries both fallen and survived, international political advertisements, in a plethora of languages that promoted support for the FMLN (Frente Farabundo Martí para la Liberación Nacional) and opposition to American governmental influence. I asked questions related to the nature of this foreign support, which my guide eagerly answered. It appeared that there had existed significant anti-war and pro-FMLN factions in Mexico, United States, Canada, France and a number of other Western European countries. The second room contained weaponry of varying size, type and country of origin. Not that I’d had any means for comparison, but it seemed a rare site to view an American and Soviet machine gun resting side by side. Which had taken more lives? I asked the guide how had the museum obtained American machine guns. He liked this question, evidenced by a smile that broke out only after he told me they had been stolen from government sponsored death squad soldiers. The tour continued through a door outside that led to more substantive reminders of the brutal conflict. 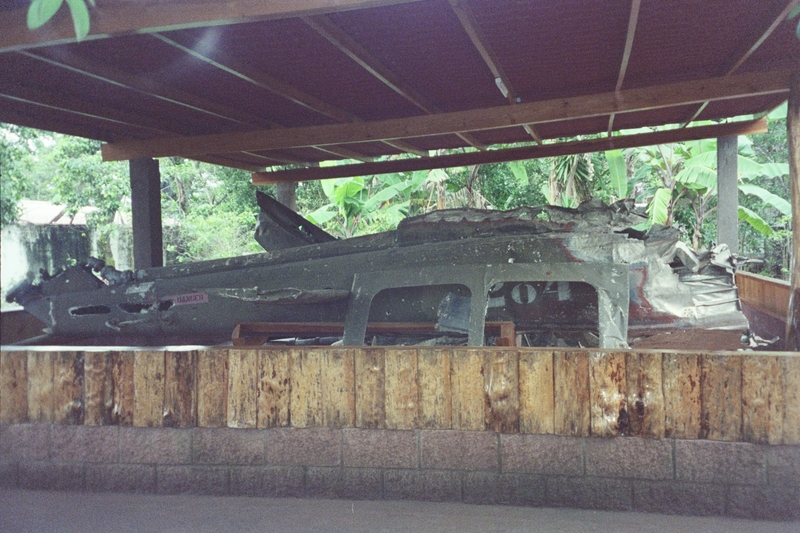 A Salvadoran military helicopter had been shot down in an ingenious example of guerrilla warfare. 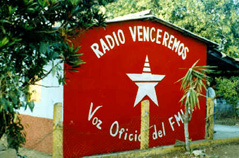 FMLN revolutionaries had rigged a bomb to look like a radio transmitter of their clandestine radio station, a much sought after target for the military. The bomb was placed in a semi-open area for the American-aided Salvadoran military soldiers to find. Thinking they had found a most advantageous device with which to intercept guerrilla co-ordinates, they carried what was actually a bomb back inside their helicopter and took off. With the helicopter hovering above Perquín, the bomb detonated, bringing flaming metal and three dead bodies back to earth, while guerrilla soldiers came out of hiding to celebrate. The FMLN had considered it a triumph since a number of high-ranking military men perished in the crash. I stared at the metal-torn wreckage now and imagined the explosive moment. From the helicopter to the clandestine radio broadcast booth, we moved on. It was a rather basic set-up, which was constantly re-located to avoid the relentless attempts by military to find and destroy it. They never did. 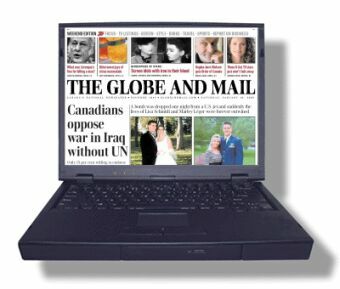 The guerrilla movement continued to organize their various platoons across the country, largely helped by way of the information sent across its airwaves. The FMLN would ultimately gain control of more than half of the country’s territory before putting down their arms in favour of the United Nations-brokered peace settlement. After a two-hour tour, I finally inquired about the guide’s limp. He fought as a guerrilla, as do all of the tour guides who run the Museum. He had taken a bullet that remained in his leg. I felt obliged to give him a tip, but it seemed incongruous to use the green currency of his perceived enemy. Gallery | This entry was posted in El Salvador, Forget-Me-Not-Nations, Journal and tagged Canada, El Salvador, Ernesto Guevara, France, Mexico, Perquín, Soviet Union, United Nations, United States. Bookmark the permalink.